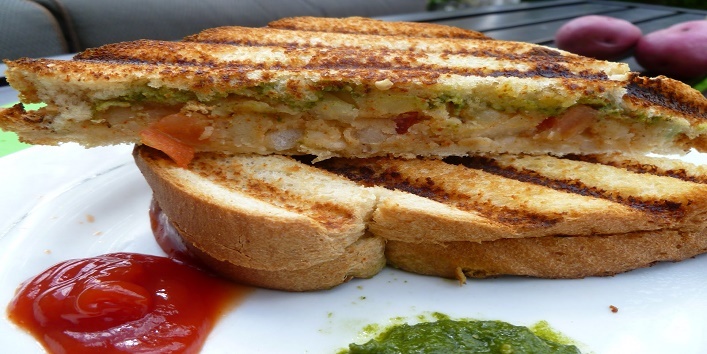 Easy peasy potato sandwich recipe that you can prepare for breakfast, evening tea or small parties and get together. 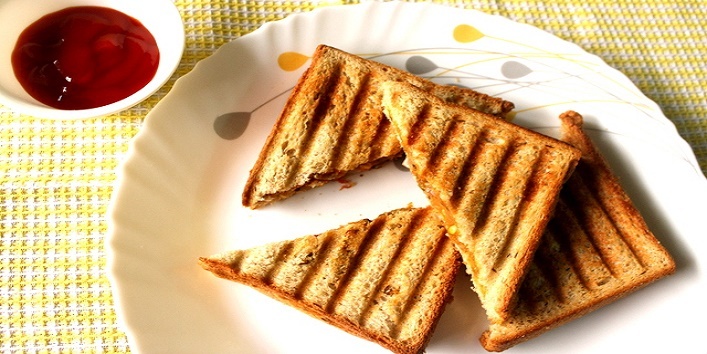 This crispy easy to make sandwiches are very filling and take almost no time to make. All you need are just some basic ingredients and you have a filling and tasty recipe ready. So without any further due let’s get started with the recipe. Red chilli powder- ¼ tsp. Peel the boiled potato and then mash it in a bowl. You can either mash it with your hands or use a potato masher for the same. Now to the potato mash add the chopped bell pepper as well as the chopped onion. Mix really well. Add the grated cheese, chaat masala, salt and the red chilli powder depending on your taste. Again mix all the spices really well with the other ingredients and keep the potato stuffing aside. Butter one side of all the bread slices. Spread the potato filling evenly on the bread slice evenly and then cover it with another bread slice. Prepare all the bread slices in a similar manner. Now heat a heavy bottomed iron skillet or pan. Add some butter to the pan and then place the sandwich in the pan. Cook the sandwich on a low flame. This way the sandwich will get heated up nicely and will attain a very crispy exterior. Once the sandwich is cooked from one side, apply some butter on the uncooked side and flip it over. Now cook the sandwich from this side as well. You can use a spatula to press the sandwich a little so that it gets cooked evenly from all the sides. When the sandwich is cooked, remove from the pan. Slice the sandwich and serve it hot with your favourite chutney, sauce or dip.